We have already helped many families, both local and afar, to say goodbye to their loved ones. Our recommendation in the Good Funeral Guide is testament to the integrity, compassion and professionalism we bring to every family who walks through our door. 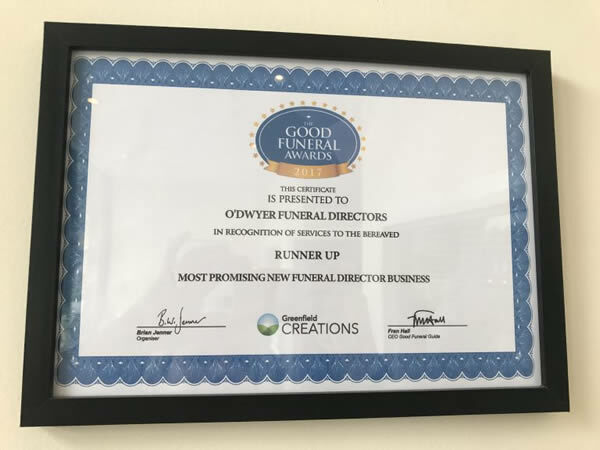 We were also the runner up in the ‘Most Promising New Funeral Director Business’ in the Good Funeral Awards 2017, and consistently get 5-star reviews on Yell.com and Google. We’re passionate about helping people in London to experience a good funeral. At a time of overwhelming grief, we support you in having the funeral you want and need to say goodbye. If you’d like to have a chat with either Don or Anthea about our services, please contact us on 020 3067 0068 any time . Please take a moment to read our full review in the Good Funeral Guide. Highly Recommended for Professionalism, Privacy, Dignity and Person Centred Attention to Detail. I highly recommend O’Dwyer’s Independent Funeral Directors for their kindness, professionalism, empathy, consideration and excellent service delivered with my mothers funeral arrangements. From my first contact with Don, I recognised the importance of professionalism, excellent listening skills and dealing with sensitive issues at such a difficult and sad time. The team exhibited respect, dignity and kindness and were able to allow for a person-centred funeral ensuring all the small details were achieved by going the extra mile. Our gratitude as a family is inexplicably inherent because of the range of skills such as respect, dignity and professionalism we as a family experienced using such a wonderful and outstanding funeral directors. Please use this service and you will have the best send off for your loved ones. O’Dwyer is a family company based in Ealing. When my Mum died in December 2017 they took care of all the arrangements. They acted swiftly and with great sensitivity at our time of grief. Don and Louise did a fantastic job and I would strongly recommend O’Dwyer as Funeral Directors. I rate them 5 stars out of 5. I wanted to write to (sincerely) thank you on behalf of the family, for your compassion, dignity & respect today at my fathers funeral. I thought everything was as perfect as one could ask on such an occasion. Thank you Don and team for your kindness and understanding during this difficult time and for assisting me through the various decisions. My sister’s funeral was carried out to a very high standard. Prior and post the funeral any queries we had were answered by phone and email immediately. Don and team were excellent, I couldn’t praise them enough. I contacted Don a month before my father sadly passed away. Immediately, I was put at ease with his professionalism and the invaluable information that he gave me. After my father passed away, he and his team treated him with dignity. We were never rushed, we felt that we were given the personal touch, he always informed us of what the next steps would be. The funeral was beautiful and dignified and I know that my father would have been proud with his send off. Death is truly hard to deal with, but Don was there every step of the way. My brother and I will be forever grateful! Thanks to Don, Victor, Louise and Peter. We chose O’Dwyer Funeral Directors having had nothing to do with arranging a funeral previously and were so glad we chose Don and his team. Don provided an excellent service, always replied straight away to any queries we had, gave his invaluable impartial advice freely and made the difficult experience of burying a loved one as stress free as possible. Costs were very reasonable and Don even put us in touch with an independent florist he felt would provide an excellent service again at a reasonable cost. We were very impressed with Don and everyone at O’Dwyer’s and would definitely recommend them for the outstanding, personal service they provided. My family and I wish to express our sincerest thanks and deepest gratitude for the utmost respect, dignity and compassion shown to us during this difficult time of my sons passing. You were so warm, kind and supportive throughout, taking the time to see me even weeks after the funeral, making a very difficult time easier. Your availability 24/7 and immediate responses to all our messages was very much appreciated. A very special thank you to your kind selective team of individuals who were very caring, respectful and compassionate not to mention extremely professional. So, please pass on our thanks to all concerned. Right from first contact your professionalism, knowledge and expertise ensured my son was transported from the mortuary to your premises immediately after having been their two months. Your army of contacts within the industry ensured I got the date I wanted for the funeral, chapel and Cemetary, concerned. I, wholeheartedly, appreciate your patience and understanding exhibited having to deal with two families with differing religious and cultural backgrounds. Last minute inclusions were dealt with kindness and compassion. The day of the funeral exceeded our expectations! Everything went exceptionally smoothly thanks to your attention to detail. Overall, your service was exemplary from start to finish and we can’t thank you enough. It was an absolute pleasure to have met you, Don, as you are a shining example and a leader in the funeral business and I do hope others follow suit. My sister died unexpectedly in London two weeks ago. I live in Ireland and was daunted by the prospect of organising a funeral service in another country. I got in touch with O’ Dwyer Funeral Directors in Ealing and Don O’ Dwyer immediately put me at ease. I felt a weight lifting from my shoulders as he and his team organised everything for me with a minimum of fuss. He dealt with the Coroner’s Office, notified the local community of my sister’s passing, made arrangements with the crematorium for the funeral service and suggested a venue for the reception after the funeral service. I was also concerned about bringing my sister’s ashes home to Ireland but again I was provided with the necessary paperwork that made my trip back to Ireland pass without a hitch. I cannot thank Don and his team (Anthea, Alan and Victor in particular) enough for their professionalism and support at what was a difficult time for my family and I highly recommend O’ Dwyer Funeral Directors to anybody wishing to arrange a funeral service of any type in the Ealing & Acton areas. I cannot thank Don and his team enough for the help and support they gave my family and I after the loss of my Grandfather. Going above and beyond dealing with the useless coroner who held my Grandfather’s body, giving us advice on all aspects of the administration involved that kind of situation and even chasing up for a death certificate weeks after my Grandfather’s funeral had passed and the bill had been paid. Don and his team are compassionate, knowledgeable and make a very upsetting process as stress free as possible. If I could rate them 10 stars, I would. My husband and I, together with all the members of our family, rate Don and his team extremely highly. Our beloved daughter passed away after a courageous battle against breast cancer and was cremated yesterday. Don was a constant source of support during the two weeks leading up to the funeral. He was available 24/7 and responded immediately to all our calls. He recommended a wonderful Celebrant, Robin Sanderson, who conducted the funeral service. We recommend Don whole-heartedly. He is efficient but compassionate and someone with whom we felt an immediate rapport. After the terrible loss of my father and during the most difficult and emotional time of our lives, the only good thing that happened is that we were fortunate enough to come across Don O’Dwyer funeral director. He handled every detail with kindness and great professionalism. The cost was reasonable, but in no way reflected the high quality of his profession or the helpful and understanding manner he treated our grieving family. I hope this review will help other people who are suffering in the same way, to choose someone as helpful, thoughtful and kind as Don. I didn’t have a clue where to start when it came to organising my dad’s funeral a few weeks ago. I found O’Dwyer ‘s website on Google and it immediately stood out to me as it was the only funeral director I’d found that had a price list on their site. I emailed them and received a prompt and welcoming response from Louise, who proved to be lovely and extremely helpful. We met to discuss arrangements and I was immediately impressed by the premises as they’ve managed to strike a balance between modern and sombre without being at all depressing or oppressive. Louise was extremely welcoming and really took on board what we wanted. We were also introduced to Don who came across as very honest and amiable. I left that day feeling completely confident that I could trust O’Dwyer to make most of the arrangements for me, which at such a difficult time, was a godsend. As well as putting me in contact with a priest, arranging the printing of the orders of service, helping with the music selection and booking the crematorium, Louise put me in contact with a florist. Becky contacted me that day and was amazing. Not only is she hugely talented and managed to produce two perfect flower displays, she is so warm, supportive and accommodating, it was a pleasure to do business with her. Over the following week, Louise was in constant contact by text and/or email, giving me updates or just asking how everything was going. She was also able to give me a rough estimate of the total cost, which was very, very reasonable and I never felt like I was being talked into something just to push the price up. On the day of the cremation, Don rang me to make sure I was ok and still happy with the plan for the day. His attention to detail was hugely touching and made me feel like he genuinely wanted to get everything perfect for my dad. The hearse and car arrived exactly on time, and Don and his staff were able to judge the mood of the situation impeccably; we really didn’t want the day to be miserable, and Don and Co were able to keep the atmosphere light but completely professional. The journey to the crematorium was timed perfectly and Don was hugely reassuring throughout our arrival and entry into the chapel. Afterwards, Don and his staff were there to guide us outside and although they were waiting to drive us onto the wake,we didn’t feel at all rushed or pressured to leave straight away. Once at the pub, Don came into the bar with me to make sure that everything was ok (even though I’d arranged the wake completely independently from O’Dwyer) and helped arrange the flowers. Before he left,he made a point of saying goodbye to myself and my dad’s partner. All in all, although planning a funeral is never nice, however, Don, Louise and Co certainly made it an easy and stress free experience. From start to finish, I felt that I was more than just another customer and I can’t sing their praises enough!